Super Healthy, Delicious, Low Carb! 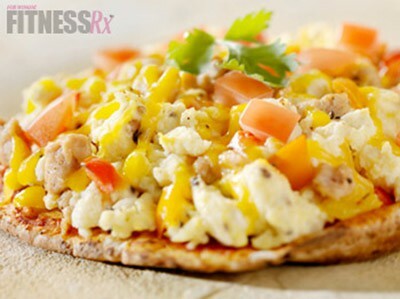 There’s never been a better time to eat pizza for breakfast than right now! I’m not talking about the unhealthy cold pizza that’s left over from the night before; the doughy pizza pulled from the cardboard box; the pizza that leaves you with heartburn and heartache. No, no, no… come on now we’re talking about a recipe that’s coming from me! I’m talking about the pizza that you are going to cook for yourself and enjoy every single morsel… without any bit of guilt! Why? Because it’s super healthy… AND delicious…. AND low carb! You can make a bunch of these at once, serve them to your kids, your family, your friends— they won’t even know they’re eating super healthy! What’s even better? Serve them fresh (they are super easy to make for a quick meal), have as leftovers (they taste great cold if you make in advance) or pack along on the go (yes, they are that versatile)! It’s pizza making time! Keeping our bodies in shape is hard work… and, yes, it absolutely does mean making sacrifices when it comes to the foods that we choose to eat! However, the key is to still enjoy the foods that you love by simply recreating them into a healthy version. That’s what I’m here for! I’ll take the guesswork away from you and bring you new recipes each and every week! It’s all about being creative with good-for-you foods! As my trademark proclaims, I will always do my best to deliver to you: 100% Taste, 0% Guilt! 1. Heat skillet, coated with non-stick cooking spray on medium heat. Add chicken and cook until no longer pink, approximately 5 minutes, stirring occasionally to separate into tiny pieces. 2. In the meantime, in a small mixing bowl, combine egg whites, tomato, bell pepper, oregano, black pepper and sea salt. Whisk together (or use a fork) until fluffy and ingredients are well blended. 3. Once chicken is cooked, add the egg white mixture to the skillet with the chicken. Use a spatula to scramble the mixture as it cooks. 4. While egg white mixture is cooking, toast the pita (optional), and spread with the tomato sauce. Set aside. 5. Once the egg whites are fully cooked to your liking (as dry or wet as you prefer), turn the heat down to low and sprinkle the cheddar cheese on top and allow to melt. 6. Once melted, transfer/slide the egg white mixture on top of the pita. Enjoy!